The Badger Ordnance IMUNS – C (COVERT) installs into any Accuracy International Chassis (with the exception of the AS-50 and AX) replacing the current bipod mounting block and allows for the use of clip on night vision and thermal imaging systems. The Covert model is made to accommodate the Accuracy International Covert with integral sound suppressor. 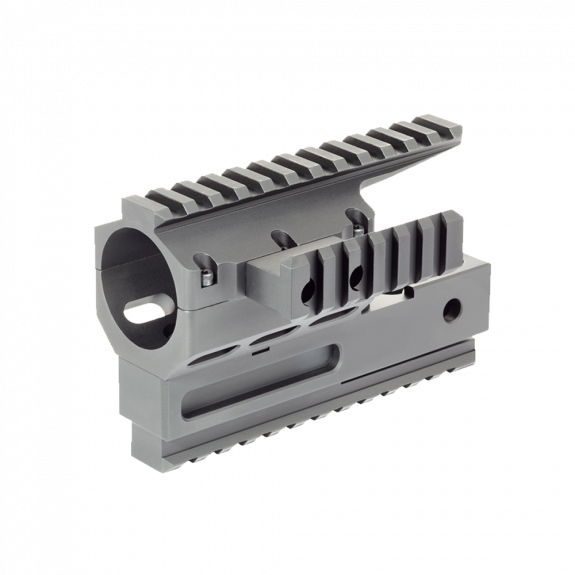 It will also accommodate larger profiled barrels, up to 1.375”. It features side accessory rails to attach laser aiming devices, such as the ATPIAL/DBAL. The IMUNS-C requires no permanent modification and has a through hole of 1.5” It is machined from 6061 Alloy and Mil Spec Type III Hard Coat anodized. Weight is 12.0 oz.